Calphalon pans are generally quite easy to clean and do not require much hard work for their maintenance; however, accidents in the kitchen can happen at any time. In case you accidentally burn your calphalon pans and are looking for easy ways on how to clean burnt calphalon pans, here is all you need to know about it! In this article, we will provide you with some amazing homemade remedies along with a review of the special Dormond Calphalon Cleaner for removal of the most stubborn burn marks from your calphalon pans. 1 What are calphalon pans? Calphalon pans are a brand of cooking pans which have stainless steel handles, a heavy gauge hard anodized aluminum body and a covering made of tempered glass. These cooking pans are used as non-stick cookware in many homes. Calphalon pans must be treated with immense care, avoiding any kind of harsh abrasives or chemical solutions being used on them, as it will damage their surfaces. Baking soda, if not used with caution, can act as an abrasive to the calphalon pans, so you must be extra careful when using this solution. Soak a slight amount of baking soda in warm water to make a solution. Pour this solution on to the burnt surface of the calphalon pans and allow it to sit for a few hours. You can gently scrub the surface using a soft sponge, but be extra cautious not to use any kind of hard brush or abrasive for doing this step. You can clean out the baking soda solution and replace it with a new one, once again using warm water. Keep on doing this till you finally see the burnt bits coming off naturally. If the baking soda solution starts turning brown, you can be assured that the solution is actually working in removing the burnt bits off your calphalon pans. Vinegar, if used on its own, can be an abrasive solution and can cause more damage than do good when it comes to cleaning your burnt calphalon pans. However, if used with extreme care and caution, you could clean your burnt calphalon pans using this solution. Place the stove on medium heat and allow it to simmer for about 10 minutes. You should find some of the burnt bits from the bottom of the pan floating up to the top of the calphalon pan naturally. Remove this from the heat and carefully throw out the vinegar and water solution. Scrub the remaining buildup at the bottom of your calphalon pan very gently. Do not use any harsh scrubbing pads of brushes on this. The rest of the burnt remains should come off quite easily. Calphalon pans are extremely prone to damage and must be treated with extreme care. While other kinds of pans can be scrubbed using a brush and cleaned with harsh, chemical solutions to remove burnt bits, this will not be safe on your calphalon pans. Dishwashing liquid can be an easy fit to removing most of the burnt bits from your calphalon pans. Add a few drops of any mild, dishwashing or hand washing liquid to your calphalon pans. Place this on the stove and allow it to simmer for about 20 minutes. Once you have done this, turn off the heat and allow the pan to rest undisturbed for another 30 minutes till it cools down completely. Use a gentle scrubbing pad to remove the burnt bits off your calphalon pans. Be extremely cautious as to not be too harsh or vigorous on the surface of the pans and damage them. These homemade remedies might work for most, however, sometimes, even these home remedies can fail. In that case, here is one of the best commercial cleaners you can use to clean your burnt calphalon pans. 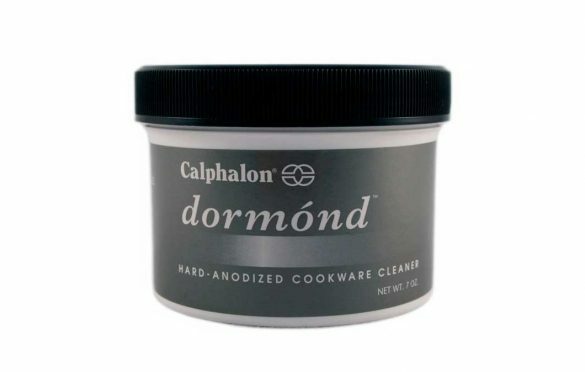 An ideal product to use for hard anodized pans, Dormond Calphalon Cleaner can help you remove the burnt bits off your calphalon pans in the easiest and effective manner. Accidents in the kitchen are very common, and these can happen to even the most careful cooks. However, you do not need to worry any longer! This gentle calphalon cleaner not only removes all kinds of cooking residue from your calphalon pans, but it also scrubs away any burnt bits, as well as restores shine and polish to the surface of your calphalon pans. 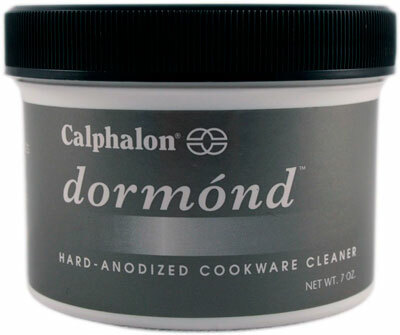 Some older, tougher burn marks may not get removed in the first try itself, however, the Dormond Calphalon Cleaner is very mild and can be used on a regular basis. Using this product a few times will effectively remove the burnt residue without much hassle! One of the best parts about this calphalon cleaner is that is it so gentle and mild that you can use it on an everyday basis without worrying about damaging the surface of your calphalon pans. A very small amount of product is necessary for cleaning and polishing. A gentle scrubbing pad is also provided along with the product which is absolutely perfect for removing any cooking residue as well as burnt bits from your calphalon pans. Simply take a small amount of product and scrub the surface of your calphalon pans in gentle, circular motions. If there are very little burnt bits, you do not even need to scrub the pans, you can simply apply the cleaner and allow it to sit for a while before you rinse it out with warm water. Click here to check the current price on Amazon. Start by preheating your oven to 550 degrees. Fill your sink with warm water and add a squirt of liquid dishwashing soap to it. Submerge your calphalon pan into the sink with warm water. Take a sponge and squirt some liquid dishwashing soap directly on to the sponge. Wet the sponge and start to clean your pan with it. Rinse the calphalon pan in cold water only, and wipe the pan. Apply some vegetable oil on to the inner (and even outer, if you feel you need to) surface of the pan. Let it sit for about 30 minutes. Turn the pan upside down and place it in your oven. You can place an aluminum sheet directly under the pan so that it can catch any oil droppings. Let the pan sit in the preheated oven for about 30 to 45 minutes. Remove your calphalon pan from the oven using oven mitts and allow it to cool down naturally. Previous Post:How to sterilize baby toys – 6 ways that work! Great cleaning tips! It’s not always easy for me to clean burnt calphalon pans, this cleaner would be worth a try. What a great blogger!! This post is perfect for housewife especially kitchen workers. Excellent mold remover tips. In the past, I use natural cleaner but now Dormond Calphalon Cleaner. Best cleaner for kitchen tools. keep it up. Hi, Thanks for sharing such useful information. You explained everything very clearly, I like your website and bookmark it.